Jiminy Cricket: Well, I'll be! Ho-ho-ho! My, my! Solid gold, too. Oh, I think it's swell. Jiminy Cricket: [seeing Pinocchio for the first time] Good piece of wood, too. Geppetto: Say hello to Figaro. Geppetto: Now, I've got just the name for you: Pinocchio! Do you like it, Figaro? Geppetto: No? You do, don't you, Cleo? Geppetto: Well, we'll leave it to little wooden head. You like it? Geppetto: Ha-ha, that settles it! Pinocchio it is! Jiminy Cricket: may be right at the wrong time, or visa versa. Jiminy Cricket: [clears throat] Understand? Pinocchio: [shakes his head] Uh-uh. But I'm gonna do right. Jiminy Cricket: Atta boy, Pinoke! And I'm gonna help ya. Jiminy Cricket: [watching] How'll he know! Jiminy Cricket: [to Monstro] Hey, blubber mouth, open up! I gotta get in there! Jiminy Cricket: [after Pinocchio falls down the stage stairs during Stromboli's puppet show] Go ahead, make a fool of yourself, then maybe you'll listen to your conscience. Geppetto: Oh, Pinocchio! How did you get down here? Geppetto: Oh, you did... Oh! You are talking! Geppetto: No! No no no! Pinocchio: Yes, and I can move too. Geppetto: No, no, you can't! I'm dreaming in my sleep! Oh, wake me up! Wake me up! Geppetto: Now we see who's dreaming. Go on, say something. Pinocchio: Gee, you're funny. Do it again! Pinocchio: Yes! The Blue Fairy came. Pinocchio: Uh-huh, and I got a conscience. Pinocchio: And someday, I'm gonna be a real boy! Geppetto: A real boy! It's my wish! It's come true! 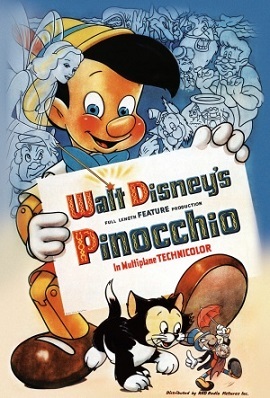 Pinocchio: [referring to Lampwick] Don't hurt him, Jiminy. He's my best friend. Jiminy Cricket: [outraged] Your best friend? And what am I? Just your conscience? Okay! That settles it! Pinocchio: I'm going to school. Foulfellow: School. Ah, yes. Then perhaps you haven't heard of the easy road to success. Foulfellow: No? I'm speaking, my boy, of the theater! Here's your apple. Foulfellow: Bright lights, music, applause! Fame! Foulfellow: Yes! And with that personality, that profile, that physique... why, he's a natural-born actor, eh, Giddy? Foulfellow: ...straight to the top! Why, I can see your name in lights, lights six feet high! Uh... what is your name? Foulfellow: We're wasting precious time. Come. On to the theater! The Coachman: And I takes 'em to Pleasure Island. Foulfellow: [nods in agreement] Ah, Pleasure Island. The Coachman: No, no. There is no risk. They never come back... as BOYS! Jiminy Cricket: Father! Huh? He ain't my father. Uh, Mr. Geppetto! Foulfellow: [after drunkenly singing "Hi-Diddle-Dee-Dee"] And the dummy fell for it. Foulfellow: Hook, line and sinker! Gideon: [Dips a smoke ring in his beer and takes a bite] Hiccup! Foulfellow: And he still thinks we're his friends. And did Stromboli pay? Plenty! Foulfellow: That shows you how low Honest John will stoop, eh, Giddy? Gideon: [nods and choking on his beer] Hiccup! Foulfellow: That's it! Stromboli! Why, that old faker would give his... Listen. If we play our cards right, we'll be on easy street or my name isn't Honest John. Jiminy Cricket: [seeing the Blue Fairy appear for the first time] As I live and breathe, a fairy. Mm-mmm! Carnival Barkers: Tobacco Row, Tobacco Row! Get your cigars, cigarettes, and chewing tobacco! Come on in and smoke your heads off! There's nobody here to stop you! Foulfellow: So, Coachman, what's your proposition? The Coachman: You know... the disobedient ones that are playing hooky from school. The Coachman: ... and I takes them to Pleasure Island. The Coachman: No, no, no, there's no risk. They never come back... as BOYS! The Coachman: Now, I've got a coach leaving the crossroads by midnight, see me there. And no double crossing! The Coachman: Any prospects you find, bring them to me. The Coachman: I'll pay you well, I've got plenty of gold. The Blue Fairy: Good Geppetto, you have given so much happiness to others, that you deserve to have your wish come true. Foulfellow: [he and Gideon have "diagnosed" Pinocchio's "condition"] My boy, you are allergic. Foulfellow: Yes, and there is only one cure: a vacation on Pleasure Island! Foulfellow: That happy land of carefree boys, where every day's a holiday! Foulfellow: [he and Gideon stop him] Why, of course you can go. I'm giving you my ticket. Foulfellow: No, tut-tut-tut, I insist: your health comes first. Foulfellow: Come, the coach departs at midnight! Jiminy Cricket: All right, then, here's what we'll tell 'em. You can't go to the theater, say thank you just the same - you're sorry, but you've got to go to school. Foulfellow: Pinocchio! Oh, Pinocchio! Woo-hoo! Jiminy Cricket: Here they come, Pinoke. Now, you tell 'em. Foulfellow: Woo hoo! Oh, little boy! Ah, there you are. Where were we? Ah, yes. On to the theater! Pinocchio: Good bye, Jiminy! Good bye! Jiminy Cricket: Good bye? Huh? Good bye? Jiminy Cricket: Hey, Pinoke! You can't go...! There he goes. What'll I do? I'll run and tell his father. No, that'd be snitching. I'll go after him myself. The Blue Fairy: Would you like to be Pinocchio's conscience? Jiminy Cricket: [Blushing] Well, uh, I... Uh-huh. Jiminy Cricket: [tipping his hat] Oh, Cricket's the name. Jiminy Cricket! The Blue Fairy: I dub you Pinocchio's conscience, lord high keeper of the knowledge of right and wrong, counselor in moments of high temptation, and guide along the straight and narrow path. Arise, Sir Jiminy Cricket. Jiminy Cricket: [Admiring his new clothes] Well! Ho-ho-ho! My, my! Mmm! Say, that's pretty swell! Gee, thanks. But, uh, don't I get a badge or something? The Blue Fairy: Well, we'll see. Jiminy Cricket: You mean maybe I will? The Blue Fairy: I shouldn't wonder. Jiminy Cricket: Make it a gold one? Jiminy Cricket: Go ahead. Tell her. Pinocchio: Yeah, two big monsters with big, green eyes! The Blue Fairy: You don't say? And where was Sir Jiminy? Jiminy Cricket: [Jumps in front of Pinocchio] Psst! Leave me out of this. Pinocchio: I didn't - they chopped me into firewood! Pinocchio: Oh, look! My nose! What's happened? Jiminy Cricket: Oh, but I have! Every single word! Jiminy Cricket: [frustrated by the clocks ticking and Geppetto's and Figaro's snoring while trying to get to sleep] QUIET! Jiminy Cricket: After all, enough is enough. Jiminy Cricket: Hey, where ya goin'? Jiminy Cricket: [following after Pinocchio] But Pinocch, are you crazy? Don't you realize he's in a whale? Pinocchio: I've gotta go to him! Jiminy Cricket: [following after Pinocchio] Hey, Pinocch! Wait! Listen here, son! Jiminy Cricket: But this Monstro, I've heard of him; he's a whale of a whale! Jiminy Cricket: Why, he swallows whole ships alive! Jiminy Cricket: Good-bye? I may be live bait down there, but I'm with ya! Foulfellow: [singing] Hi-diddle-dee-dee / An actor's life for me / A high silk hat and a silver cane / A watch of gold with a diamond chain / Hi-diddle-dee-day / an actor's life is gay / It's great to be a celebrity / An actor's life for me! The Coachman: Give a bad boy enough rope, and he'll soon make a jackass of himself. The Blue Fairy: Little puppet made of pine, awake. The gift of life is thine. Geppetto: [relieved] Oh, it's me. The Blue Fairy: A boy who won't be good might just as well be made of wood. Jiminy Cricket: You buttered your bread. Now sleep in it! Lampwick: [picks up Jiminy] Hey, who's the beetle? The Blue Fairy: A lie keeps growing and growing until it's as plain as the nose on your face. Jiminy Cricket: Well... guess he won't need me anymore. What does an actor want with a conscience, anyway? The Coachman: And what might your name be? The Coachman: So you can talk? Alexander: Yes, sir. I wanna go home to my mama! The Coachman: Take him back! He can still talk! Alexander: Please, please, I don't wanna be a donkey! Let me outta here! The Coachman: [cracks his whip] Quiet! You boys have had your fun. Now pay for it! Jiminy Cricket: Shhh! Quiet! Let's get out of here before something else happens. Pinocchio: [has just reunited with Geppetto] Hey, Father! Father! Geppetto: Don't bother me now, Pinocchio! What? Pinocchio? Pinocchio: Father, whatcha crying for? Geppetto: Because... you're dead, Pinocchio. Pinocchio: No! No, I'm not. Pinocchio: But father, I'm alive. See? Pinocchio: And... and I'm... I'm real. I'm a real boy! Geppetto: You're alive! And... and you are a real boy! Jiminy Cricket: [to Pinocchio] Remember what I said about temptations? Pinocchio: Oh, no, Jiminy. That's Mr. Honest John. Jiminy Cricket: [shocked] Honest John? Jiminy Cricket: [shouting] Pinocchio! So this is where I find you! How do you ever expect to be a real boy? Look at yourself. Smoking! Playing pool! Jiminy Cricket: Oww! You're comin' right home with me this minute! [Having been ditched by Pinocchio, Jiminy Cricket starts to leave Pleausre Island] Jiminy Cricket: Lampwick, hmph! Lampwick! Burns me up after all I tried to do for him. Who's his conscience, anyway? Me or that hoodlum Lampwick? Well, I've had enough of this. I'm takin' the next boat outta here. Foulfellow: [seeing a poster for Stromboli's puppet show] Well, well, well! Stromboli! So that old rascal's back in town, eh? Foulfellow: Remember the time I put strings on you and passed you off as a puppet? [Foulfellow laughs] Foulfellow: We nearly put one over on that old gypsy that time. Stromboli: [shuts Pinocchio up in a cage] There! This will be your home - where I can find you always! Stromboli: Yes, yes, yes! To me, you are a belonging. We will tour the world: Paris, London, Monte Carlo, Constantinopolee. Stromboli: [bangs his fist on the table] YES! We start TONIGHT! Stromboli: And when you are growing too old, you will make good firewood! Stromboli: Ha, ha, ha, ha, ha, ha, ha! Pinocchio: Let me out of here! I'm gonna get out! You can't keep me...! Stromboli: QUIET! Shut up before I knock you silly! Stromboli: Good night, my little wooden gold mine! Ha, ha, ha, ha, ha, ha, ha, ha! Geppetto: Get out? Oh, no, no, son. I have tried every way. Why, I even built a raft. Geppetto: No, no, no, no. Now listen, son. He only opens his mouth when he's eating. Then everything comes in; nothing goes out. Geppetto: Yes, it's hopeless, Pinocchio. Come, we'll make a nice fire and we cook some of the fish. Pinocchio: A fire? That's it! Geppetto: Yes, and then we'll all eat again. Pinocchio: A great big fire; lots of smoke! Geppetto: Smoke? Oh, yes, sure. Smoked fish will taste good. Geppetto: Pinocchio, not the chair! Pinocchio: Hurry, Father, more wood! Geppetto: But what'll we sit on? Pinocchio: We won't need it. We're getting out! Geppetto: Getting out? But how? Pinocchio: We'll make him sneeze! Geppetto: Make him sneeze? Oh, that will make him mad! Jiminy Cricket: A fine conscience I turned out to be! Lampwick: Huh! To hear that beetle talk you'd think somethin' was gonna happen to us. Lampwick: Wheres he get that stuff? "How do you ever expect to be a real boy?" What's he think I look like? Pinocchio: You sure do! Ha-ha, Hee-haw! Lampwick: Hey, you laugh like a donkey. Ha-ha Hee-haw! Lampwick: Did that come outta me? Lampwick: Aaaahh! I've been double-crossed! Help! Help! Somebody, help! I've been framed! Help! Lampwick: Please, you gotta help me. Be a pal! Call that beetle. Call anybody! Lampwick: Mama! Maaaaaaaaaamaaaaaaaaaaa! Hee-haw! Hee-haw! Hee-haw! Hee-haw! Pinocchio: I'd rather be smart than be an actor. Lampwick: You smoke like my grandmother. Jiminy Cricket: Needs a little oil. Jiminy Cricket: That's what I said.